This morning, I ran out of the house wearing two mismatched socks and a tie-dyed scrunchie. A scrunchie, people! Hello, 1986 called and wants its wardrobe back. And the worst part? I totally realized it but we were already running late and I was just too rushed to care. You see, mornings continue to be utter chaos in our house. Both of our babies are young enough to need help brushing their teeth and getting ready but old enough to flail around and loudly and determinedly exclaim, "I do it myself! Myseeeeeeeelf!" Add in packing lunches, organizing bags, and loading the car and you have the perfect recipe for being on time, well, just about never. The worst part? Breakfast. We try to feed the babies a healthy breakfast (generally oatmeal) but they're never into it and we basically end up chasing them around the house so they eat a few bites. Often, I squish in the backseat and sit in between their giant car seats and feed them their oatmeal on the way. There is no better reminder that I ate far too many cookies this holiday season than forcing myself to fit into the 12 inch space between two monstrous car seats. While wearing my puffy winter coat. All this to say that when this month's Blogger CLUE theme of "Eat Healthy" was announced, I frantically searched my blog buddy Stacy's blog, Food Lust People Love, for a healthy breakfast recipe that the babies would eat on their own. Preferably with me in the front seat. 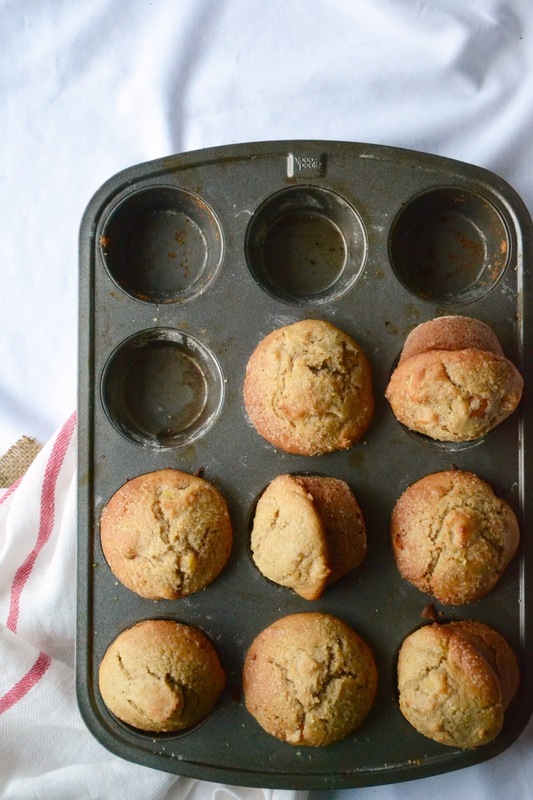 Enter Stacy's fantastic collection of muffin recipes under her banner Muffin Mondays. Once a month (on a Monday, obvs), Stacy and a group of her muffin-loving buddies get together to share muffin recipes like this Chocolate Chocolate Chip Muffin! Oh be still my heart. But since I want to wait until the babies are in college for them to realize chocolate constitutes an appropriate breakfast, I landed on these delicious-looking Sticky Toffee Bran Muffins. They're naturally sweetened with dates and they have bran which automatically equals healthy in my world. 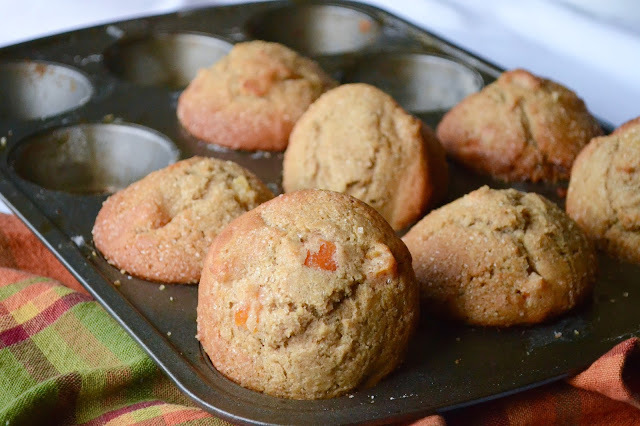 I'd love to believe our babies will eat dates but I'm trying to be mores realistic this year so I swapped the dates for dried apricots and these Apricot Breakfast Muffins were born! Low in sugar, high in bran, and topped with sugar crystals because I will try anything to get them to eat on their own. The verdict? The babies called these muffins cupcakes and could not stuff them in their mouths fast enough. But they still insisted I sit in the backseat, delicately wedged in between their car seats. Your muffins sound terrific! I'd love to start my day with one (or two!!!). Thanks Liz, that's just what we did this morning! Puffy coats definitely hamper all kinds of movement. I remember those days, as well as the days of chasing kids around. Unfortunately, that doesn't ever stop. It just morphs into attitude. I'm loving the sound of those muffins, my friend. Anything that 'appears' healthy is good in my book. Oh gosh, attitude. I don't think I'll ever be ready for that. I'll just keep reminding myself it's just a strong sense of self. Or something. Love this post - totally made me grin from beginning to end. I only have one baby I chase around with oatmeal, and everything else - but I feel your pain (and joy) <3 ! Thanks for the smiles today, Azmina! I've actually been doing Muffin Monday, but solo, for a very long time so next time just do a blog search and you will find all sorts of muffin options. I'm glad your babies liked the muffins! I do remember those days of "Myseeeeeeelf!" so well! Oh my gosh I had no idea! I'm coming back to do a wider muffin search because we loved these! I had to chuckle while reading your post. I do believe all mother's can relate to those mornings. I have a daughter who is NOT a morning person. I would go to work frayed exclaiming that all I wanted was a morning without a screaming child. I do believe these wonderfully healthy cupcake muffins would have solved the problem! In fact, they would make anybody smile! Hah, that makes me feel better! I could definitely do without the screaming. Or at least more coffee. I am just so happy that your post was first on the list. That means I started my day off with a belly laugh. I just love your posts and the muffins look fantastic. Of course, it is hard to go wrong using one of Stacy's recipes. So kind of you, Wendy! It's definitely more humorous in hindsight. In the moment, it's exactly like you'd expect, being squished between two crabby babies in giant plastic carseats! hahahah!! Shades of days past for me. Oh how well I remember those days. Now I still get up to make breakfast, but the girl child eats then rushes out the door to drive herself to school. Enjoy those days while you can! And better yet... enjoy them with more muffins!! Drives herself to school?! Gah! Does not compute. Can't we keep them as babies forever?! Oh man, your morning sounds like ours. Hang in there mama. These muffins would make any morning SO much better! Love the apricots! OMG Kelly, that makes me feel so much better! I'm so glad we're all in the same frenzied boat together. I hope your family had a great new year! 1986 called???? Bahahahahah!!!! Love this recipe. Hopefully you have time to stop by and see the two (yes two) fantastic recipes I hijacked off your sight this month!!! Yes! I love them both and am so glad you liked them as well! Whenever I think about eating more veggies, I go to those two recipes! Thanks Lisa! I hope you, Charles, and the furry babies had a great new year! My little man likes muffins, too! And trust me, I know how long it can take a young one to eat a bowl of cereal or oatmeal! These sound like the ideal morning on the go breakfast. Wow! Does your home ever sound busy in the mornings! Ohhh these sound fantastic!! I love anything apricot, will have to try these VERY soon. These sound delicious. Apricots, dates, they are all fabulous in my book. Gah! Such a good description. I feel like the Michelin Man everyday in that coat. I am keeping my eye on post-winter sales so I can buy a real wool coat and not look like I'm 12 years old in my puffy jacket.